Genealogists are a strange bunch. Just ask my son. Since he was old enough to walk, he has accompanied me on many a jaunt to a cemetery to go grave-hunting for long, lost ancestors. We would comb the rows of tombstones, trying to find where great-great-grandpa Casper was buried. Eureka! We found him, we’d whoop! Even though he was just a small boy, he was never afraid to go with me. “You have nothing to fear in a cemetery – remember, it’s the living you have to worry about, son, not the dead,” I always told him. I think he was as fascinated with some of the tombstones and the stories they told as I was. When he was a little older, I took him to Memorial Day observances at the local cemetery. I felt it was important that he know about the sacrifices that our veterans have made. When he was a little older, I watched him march in his Cub Scout uniform in the Memorial Day Parade. Later, as a teenager, just as I had done twenty years before, he marched in the Memorial Day Parade as a member of the high school band. I thought about all that when my husband and I drove out to Maple Grove Cemetery last Monday morning. The cemetery was full of people, as the Memorial Day Parade had just ended. Parents, children, grandparents…people were headed back to their cars, or placing flowers, or stopping by a grave to remember a loved one. We were there to plant flowers on Mark’s great aunt’s grave. While researching the Kline side of the family, I had found great aunt Grace’s obituary last summer. I realized, after reading it and then talking to my father-in-law, that she and her husband, Homer Gray, had never had any children. My husband offered to go with me to Ravenna to see if we could find her grave at Maple Grove. After a lot of walking, we finally found it! But there were no flowers on it. Clearly, no one was tending this grave. After all, I had grown up watching my own mother (and grandmother) faithfully tend our family’s graves. Every fall, my mom collects the flower pots, discards the dead flowers and stores the empty pots in the garage. Then, just before Memorial Day, she buys new flowers, replants them and hauls them to the cemeteries so the graves look nice for Memorial Day. My grandmother is gone now and my mother is 75 years old with a heart condition – but she still does this every year. I know when she can’t do it any longer, it will be my turn. 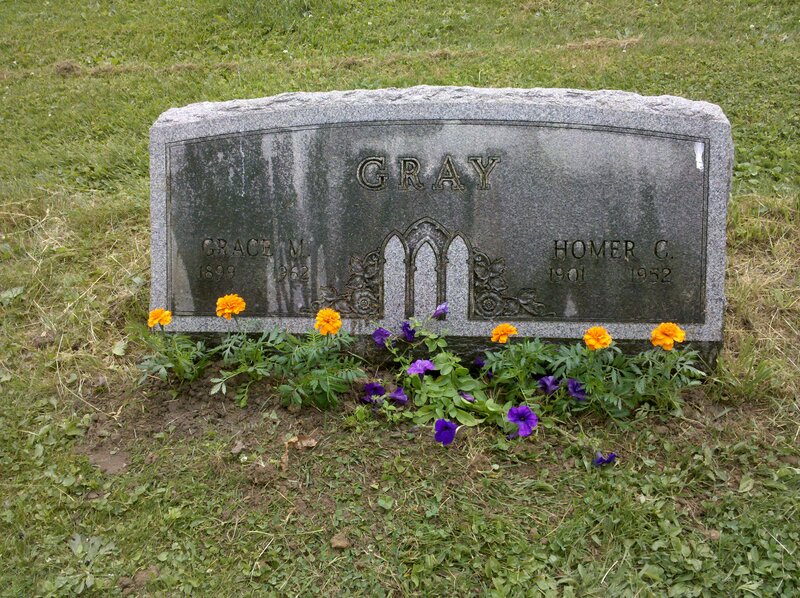 So Mark and I decided to “adopt” great aunt Grace and great uncle Homer’s graves and decorate them for Memorial Day. So that’s why we were at Maple Grove last Monday, just planting a few flowers. Below is Aunt Grace’s obituary, which ran in the Ravenna Record Courier on May 31, 1962. If anyone has a photo of Aunt Grace, please email it to Knapp Notes so I can post it to the Photo Gallery. If you click on the photo of Aunt Grace’s tombstone above, you can see a larger version of the photo. Aren’t cell phone cameras amazing? I have also included a picture of Mark wielding his trowel in the Photo Gallery, in case you want to check it out. Mrs. Grace K. Gray, 63, of 131 N. Walnut St., Ravenna, a receptionist in the office of Dr. Earl O. Stevens for more than 35 years, died in Robinson Memorial Hospital at 7:05 p.m. Tuesday. Ill since last August, Mrs. Gray was admitted to the hospital March 9. Her husband, Homer, died in 1952. Mrs. Gray was born in Rootstown, April 10, 1889, and had been a resident of this area her entire life. She was a daughter of the late Mr. and Mrs. Henry C. Kline. She was a member of the Immaculate Conception Church. Surviving are three brothers, Ervin Kline of Bucyrus, O., Gus Kline of Rootstown, and Joseph Kline, Ravenna; and a sister, Mrs. Florence Knapp of Kent. Requiem mass at the Immaculate Conception Church will be at 9 a.m. Saturday. Burial will be in Maple Grove Cemetery. Friends will be received at the Wood Funeral Home, Ravenna, from 7-9 p.m. Friday. This entry was posted in Family History, Photos and tagged family history, Grace Gray, Gray, Homer Gray, Kline, Knapp, Memorial Day. Bookmark the permalink.